The fans could enjoy quite many interesting games in the last day. The day ended with defeat of the leader and favorites losing the games. Here is the last day review presented by ESL. The most crucial game of the last day was another loss of top-ranked Windy City Bulls (26-22) in Hoffman Estates on Friday night. Hosts were defeated by fourth ranked Erie Bay Hawks (22-27) 115-101. Erie Bay Hawks dominated down low during the game scoring 80 of its points in the paint compared to Windy City Bulls' 56. Erie Bay Hawks looked well-organized offensively handing out 30 assists comparing to just 16 passes made by Windy City Bulls' players. Australian center Isaac Humphries (216-98, college: Kentucky) orchestrated the victory with a double-double by scoring 20 points, 11 rebounds and 4 assists. point guard Anthony Barber (188-94, college: NC State) contributed with 20 points, 10 assists and 4 steals for the winners. Guard Walter Lemon-Jr (190-92, college: Bradley) answered with 16 points and 7 assists for Windy City Bulls. Windy City Bulls' coach rotated ten players which allowed the starters a little rest for the next games. Erie Bay Hawks maintains fourth place with 22-27 record. Windy City Bulls at the other side still keep top position with 22 games lost. Erie Bay Hawks are looking forward to face higher ranked Knicks (#3) in Westchester in the next day and it will be quite challenging to get another victory. Windy City Bulls will play at home against Canton Charge and are hoping to win this game. Important game to mention about took place in Mississauga. First ranked Magic (31-18) saved a 1-point victory on the road edging second-ranked Raptors 905 (29-19) 105-104 in the game for the first place. Guard Troy Caupain (193-95, college: Cincinnati) stepped up with a double-double by scoring 23 points, 9 rebounds and 11 assists for the winners and Melvin Frazier chipped in 21 points and 7 rebounds. Magic's coach allowed to play the deep bench players in such tough game. 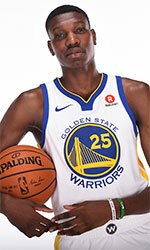 Canadian-Saint Lucian power forward Chris Boucher (208-93, college: Oregon) responded with a double-double by scoring 24 points and 13 rebounds. Magic have a solid series of three victories in a row. They maintain first place with 31-18 record. 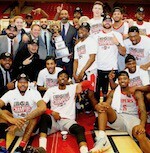 Defending champion Raptors 905 keeps the second position with 19 games lost. Magic will have a break next day, and it should allow them to practice more before next game. Raptors 905 will play again on the road against the league's leader Magic in Lakeland and it may be a tough game between close rivals. An interesting game for Drive (25-22) which played road game in Canton against 4th placed Canton Charge (21-28). Second ranked Drive had an easy win 133-102. It ended at the same time the three-game winning streak of Canton Charge. Kalin Lucas nailed 31 points and 4 assists for the winning side. JaCorey Williams came up with 21 points for Canton Charge in the defeat. The winner was already known earlier in the game, so both coaches allowed to play the bench players saving starting five for next games. Drive maintains second place with 25-22 record having eight points less than leader Windy City B. Loser Canton Charge keeps the fourth position with 28 games lost. They share it with South Bay L.. Drive will meet Fort Wayne Mad Ants (#3) on the road in the next day, which may be the game of the day. Canton Charge will play against the league's leader Windy City Bulls in Hoffman Estates and hope to secure a win. An interesting game for Salt Lake City Stars (27-23) which played road game in Des Moines against 4th placed Wolves (20-30). Second ranked Salt Lake City Stars managed to get a 6-point victory 109-103. It ended at the same time the three-game winning streak of Wolves. The best player for the winners was Tyler Cavanaugh who had a double-double by scoring 18 points, 13 rebounds and 4 assists. Both coaches used bench players and allowed the starting five to rest. Salt Lake City Stars maintains second place with 27-23 record having three points less than leader Windy City B. Wolves at the other side keep the fourth position with 30 games lost. An interesting game for Warriors (33-15) which played road game in Ontario against 3rd placed Clippers (25-23). First ranked Warriors managed to get a 4-point victory 113-109. Alen Smailagic orchestrated the victory with a double-double by scoring 21 points and 11 rebounds. Warriors' coach used an eleven-player rotation in such tough game. Warriors maintains first place with 33-15 record. Loser Clippers keep the third position with 23 games lost. Warriors will have a break next day. Clippers will play again on the road against the league's leader Warriors in Bismarck and it may be a tough game between close rivals. In the last two games of day 125 Memphis H. were smashed by OKC Blue on the road 120-96. Long Island N. won against Delaware BC on its own court 142-133. The most impressive performance of 125th day was 15 points, 17 rebounds and 5 assists by Angel Delgado of Agua Caliente C.. The most crucial game of the last day was another loss of top-ranked Windy City Bulls (26-22) in Hoffman Estates on Friday night. Hosts were defeated by fourth ranked Erie Bay Hawks (22-27) 115-101. Erie Bay Hawks dominated down low during the game scoring 80 of its points in the paint compared to Windy City Bulls' 56. Erie Bay Hawks looked well-organized offensively handing out 30 assists comparing to just 16 passes made by Windy City Bulls' players. Australian center Isaac Humphries (216-98, college: Kentucky) orchestrated the victory with a double-double by scoring 20 points, 11 rebounds and 4 assists. Point guard Anthony Barber (188-94, college: NC State) contributed with a double-double by scoring 20 points, 10 assists and 4 steals for the winners. Guard Walter Lemon-Jr (190-92, college: Bradley) answered with 16 points and 7 assists and forward Kaiser Gates (203-96, college: Xavier) added 15 points and 8 rebounds in the effort for Windy City Bulls. Both teams had five players each who scored in double figures. Windy City Bulls' coach rotated ten players which allowed the starters a little rest for the next games. Erie Bay Hawks maintains fourth place with 22-27 record. Windy City Bulls at the other side still keep top position with 22 games lost. Erie Bay Hawks are looking forward to face higher ranked Knicks (#3) in Westchester in the next day and it will be quite challenging to get another victory. Windy City Bulls will play at home against Canton Charge and are hoping to win this game. An interesting game for Drive (25-22) which played road game in Canton against 4th placed Canton Charge (21-28). Second ranked Drive had an easy win 133-102. It ended at the same time the three-game winning streak of Canton Charge. Drive dominated down low during the game scoring 74 of its points in the paint compared to Canton Charge's 54. They outrebounded Canton Charge 51-30 including a 37-24 advantage in defensive rebounds. Drive shot the lights out from three sinking 15 long-distance shots on high 51.7 percentage. They looked well-organized offensively handing out 24 assists. Point guard Kalin Lucas (185-89, college: Michigan St.) nailed 31 points and 4 assists for the winning side and center Adam Woodbury (216-94, college: Iowa) accounted for 15 points and 14 rebounds (on 7-of-9 shooting from the field). Forward JaCorey Williams (203-94, college: Middle Tenn.St.) came up with 21 points and forward Jaron Blossomgame (201-93, college: Clemson) added 17 points respectively for Canton Charge in the defeat. Both teams had five players each who scored in double figures. The winner was already known earlier in the game, so both coaches allowed to play the bench players saving starting five for next games. Drive maintains second place with 25-22 record having eight points less than leader Windy City B. Loser Canton Charge keeps the fourth position with 28 games lost. They share it with South Bay L.. Drive will meet Fort Wayne Mad Ants (#3) on the road in the next day, which may be the game of the day. Canton Charge will play against the league's leader Windy City Bulls in Hoffman Estates and hope to secure a win. An interesting game for Salt Lake City Stars (27-23) which played road game in Des Moines against 4th placed Wolves (20-30). Second ranked Salt Lake City Stars managed to get a 6-point victory 109-103. It ended at the same time the three-game winning streak of Wolves. Salt Lake City Stars made 19-of-24 charity shots (79.2 percent) during the game. They outrebounded Wolves 49-37 including 40 on the defensive glass. The best player for the winners was forward Tyler Cavanaugh (206-94, college: G.Washington) who had a double-double by scoring 18 points, 13 rebounds and 4 assists. Guard Isaiah Cousins (193-94, college: Oklahoma) chipped in 27 points and 4 assists. Guard CJ Williams (196-90, college: NC State) produced 15 points and 4 assists and forward Hakim Warrick (206-82, college: Syracuse) added 18 points respectively for the hosts. Five Wolves players scored in double figures. Both coaches used bench players and allowed the starting five to rest. Salt Lake City Stars maintains second place with 27-23 record having three points less than leader Windy City B. Wolves at the other side keep the fourth position with 30 games lost. Important game to mention about took place in Mississauga. First ranked Magic (31-18) saved a 1-point victory on the road edging second-ranked Raptors 905 (29-19) 105-104 in the game for the first place. Magic forced 23 Raptors 905 turnovers. Their players were unselfish on offense dishing 23 assists. Guard Troy Caupain (193-95, college: Cincinnati) stepped up with a double-double by scoring 23 points, 9 rebounds and 11 assists for the winners and guard Melvin Frazier (198-96, college: Tulane) chipped in 21 points and 7 rebounds. Magic's coach allowed to play the deep bench players in such tough game. Canadian-Saint Lucian power forward Chris Boucher (208-93, college: Oregon) responded with a double-double by scoring 24 points and 13 rebounds and guard Jordan Loyd (193-93, college: Indianapolis) scored 22 points, 5 rebounds and 4 assists. Four Magic and five Raptors 905 players scored in double figures. Magic have a solid series of three victories in a row. They maintain first place with 31-18 record. Defending champion Raptors 905 keeps the second position with 19 games lost. Magic will have a break next day, and it should allow them to practice more before next game. Raptors 905 will play again on the road against the league's leader Magic in Lakeland and it may be a tough game between close rivals. An interesting game for Warriors (33-15) which played road game in Ontario against 3rd placed Clippers (25-23). First ranked Warriors managed to get a 4-point victory 113-109. Warriors dominated down low during the game scoring 76 of its points in the paint compared to Clippers' 54 and made 16-of-20 free shots (80.0 percent) during the game. Serbian forward Alen Smailagic (207-0) orchestrated the victory with a double-double by scoring 21 points and 11 rebounds. Guard Damion Lee (198-92, college: Louisville) contributed with 17 points and 6 rebounds for the winners. Warriors' coach used an eleven-player rotation in such tough game. Forward Johnathan Motley (206-95, college: Baylor) answered with 28 points, 5 rebounds and 4 assists and Dominican forward Angel Delgado (206-94, college: Seton Hall) added 15 points, 17 rebounds and 5 assists in the effort for Clippers. Both teams had five players each who scored in double figures. Warriors maintains first place with 33-15 record. Loser Clippers keep the third position with 23 games lost. Warriors will have a break next day. Clippers will play again on the road against the league's leader Warriors in Bismarck and it may be a tough game between close rivals. The game between closely ranked teams ended with first ranked OKC Blue's (33-16) home victory over second-ranked Hustle (29-21) in Oklahoma City 120-96 on Friday. OKC Blue made 21-of-24 free shots (87.5 percent) during the game. They also forced 21 Hustle turnovers. They looked well-organized offensively handing out 27 assists comparing to just 12 passes made by Hustle's players. Guard Dezmine Wells (196-92, college: Maryland) orchestrated the victory by scoring 15 points, 8 rebounds and 6 assists. Forward Donte Grantham (203-95, college: Clemson) contributed with 17 points and 5 rebounds for the winners. OKC Blue's coach felt very confident that he used 10 players and allowed the starting five to get some rest. Guard Dusty Hannahs (190-93, college: Arkansas) answered with 20 points and 4 assists and guard Markel Crawford (196-94, college: Mississippi) added 19 points in the effort for Hustle. Five OKC Blue and four Hustle players scored in double figures. OKC Blue have a solid series of three victories in a row. They maintain first place with 33-16 record, which they share with Rio Grande VV. Loser Hustle keeps the second position with 21 games lost. OKC Blue will face Austin Toros (#3) at home in the next day, which may be the game of the day. Rather expected game when 4th placed Blue Coats (19-29) lost to first ranked Long Island Nets (34-15) in Uniondale 133-142 on Friday. Long Island Nets shot 31 for 42 from the free-throw line, while Blue Coats only scored thirteen points from the stripe. They outrebounded Blue Coats 53-39 including 40 on the defensive glass. Long Island Nets looked well-organized offensively handing out 30 assists. Blue Coats were plagued by 28 personal fouls down the stretch. Center Alan Williams (203-93, college: UCSB) orchestrated the victory with a double-double by scoring 25 points and 15 rebounds. Bosnian Dzanan Musa (200-99, agency: BeoBasket) contributed with 26 points, 6 rebounds and 5 assists for the winners. Long Island Nets' coach used a ten-player rotation and allowed the starting five to get some rest. Rashad Vaughn (198-96, college: UNLV) answered with 27 points and guard Shake Milton (198-96, college: SMU) added 26 points and 4 assists in the effort for Blue Coats. Five Long Island Nets and four Blue Coats players scored in double figures. Long Island Nets maintains first place with 34-15 record. Loser Blue Coats keep the fourth position with 29 games lost. Long Island Nets will face Herd (#5) in Oshkosh in the next day. Blue Coats will play at home against Maine Red Claws and it may be a tough game between close rivals.